Although my candy recipients appreciate all the candies I make, the majority of them are most eager to sample the toffee. This year I made two different kinds of toffee: the same classic English Toffee I have been making for a decade and Coffee English Toffee, which I first made earlier this year. In the USA, English Toffee, made famous by Brown and Haley’s pink tins of Almond Roca, is a bit of a misnomer—like English muffins or French fries. The toffee you typically find in England is actually more like a semi-hard caramel. A former co-worker brought some back from England last year and I eagerly helped him finish the bag of toffee chunks. I’ll take either kind of toffee, thank you. Making English Toffee isn’t terribly difficult, but it does take a little time. Since it is so popular with my candy recipients, I make 3 – 4 batches, usually over the course of 2 evenings. I grind up 10 pounds of almonds for coating, though not all 10 pounds go into the candy. I usually lose about 15% to almond flour, generated during the chopping process, which I sift out. 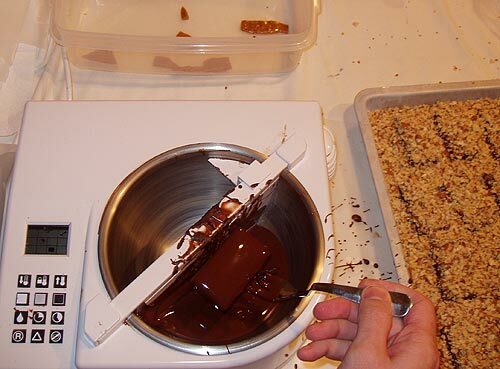 It’s easiest to coat the dipped toffee by laying them in a bed of almonds; a couple pounds go to layering 2 jellyroll pans. A few hours of dipping and coating with almonds, and I’m done. To differentiate the toffees, I left the tops of the coffee toffee almond-free, and later striped them with milk chocolate. If you have never made toffee before and would like to, I’d recommend skipping the enrobing and coating with almonds for your first batch. 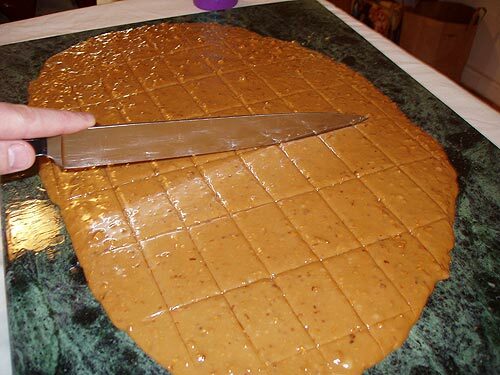 You’ll shave off at least an hour or two in prep time and get a feel for making toffee. 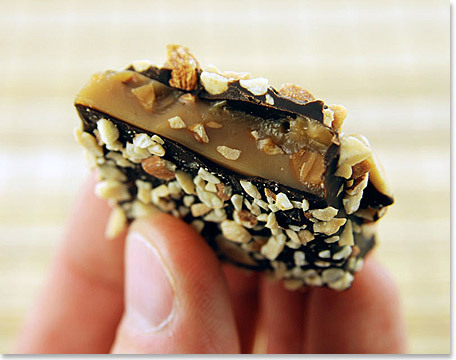 Un-dipped toffee is great broken over coffee ice cream or just eaten raw. With all the butter and sugar, what isn’t there to like? 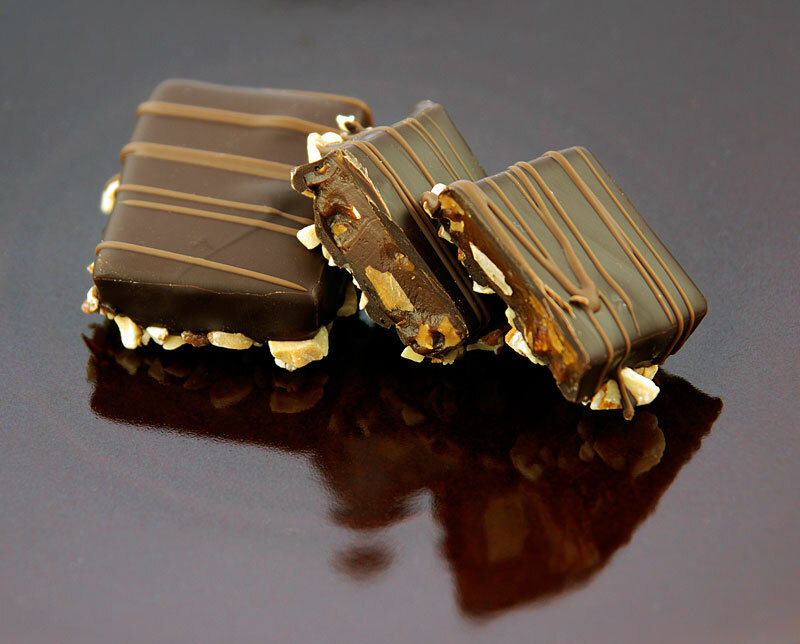 English Toffee, like most sugar candies, is hygroscopic, which just means it absorbs moisture from the air. 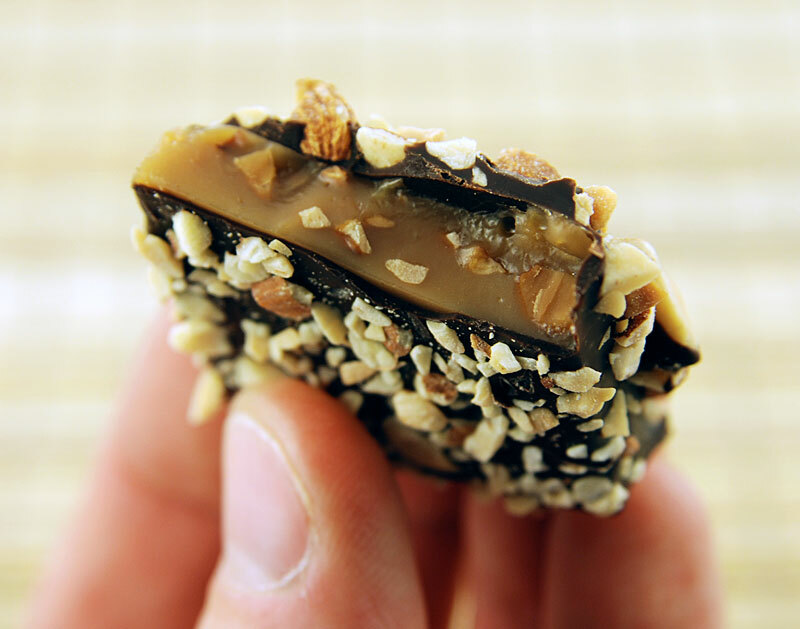 Excessive exposure to air will cause the toffee to lose its crunch, so you want to keep it wrapped with waxed paper in an airtight container until you are ready to serve. Of course, the best, and most delicious way to safeguard toffee from humidity is to wrap it in chocolate. I like dark chocolate, so I dip mine in 72% Valrhona Araguani chocolate and then set them in a bed of freshly chopped almonds. 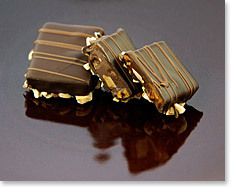 Dipped toffee will stay fresh for several weeks. 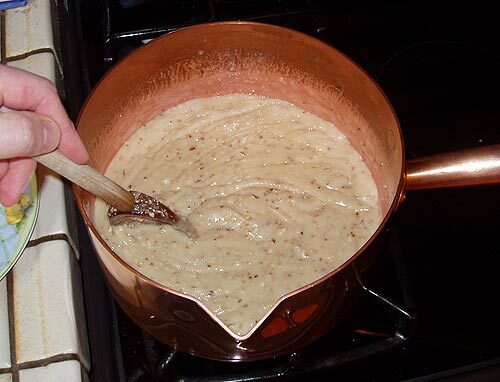 Cook 2 1/2 cups unsalted butter, 2 cups sugar, 1/2 cup water, 1 teaspoon salt and 1 cup of chopped almonds until mixture registers 305° F while stirring constantly. Quickly pour toffee onto oiled marble board or silpat mat. As it cools, repeatedly score toffee to desired sizes. 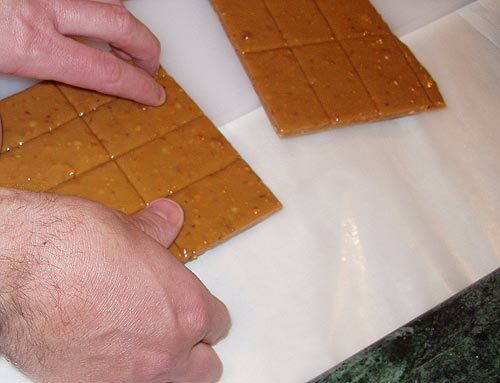 Once toffee cools you can slide it over the edge of working surface and break along score lines. 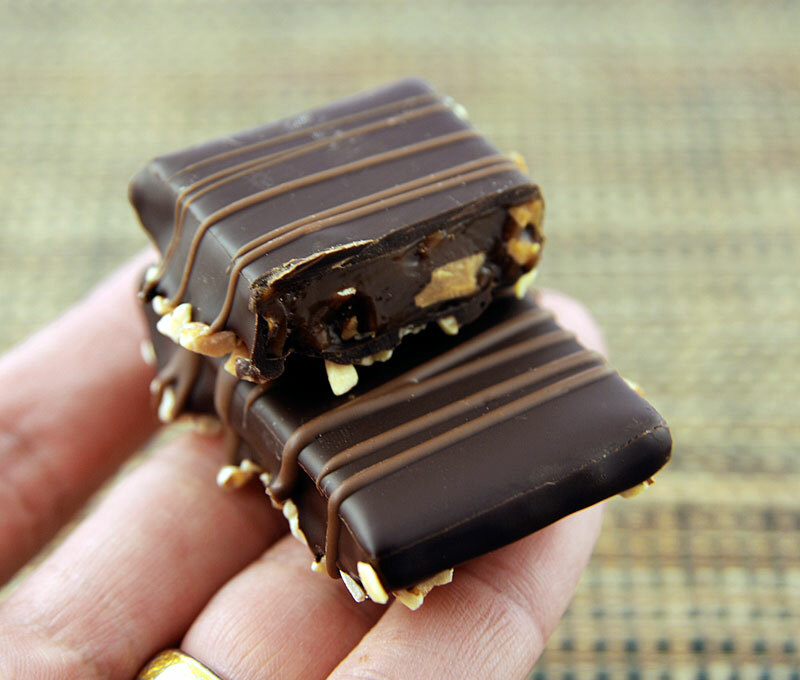 Dip toffee in your favorite chocolate. 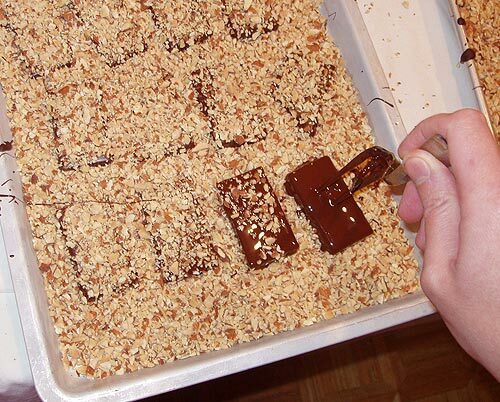 Place dipped toffee in a bed of chopped almonds. Sprinkle almonds over top to completely cover in almonds. 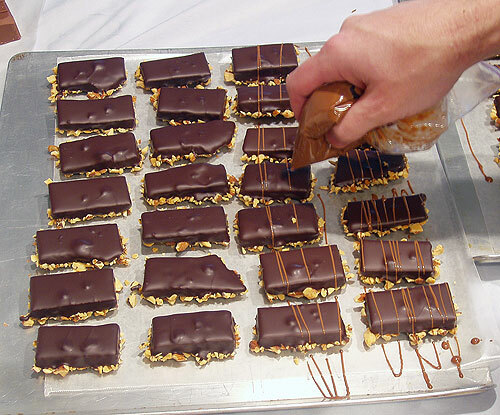 You can also skip the top coating of almonds and drizzle contrasting stripes of milk or white chocolate on the tops. This entry was posted on Sunday, January 13th, 2008 at 7:20 pm	and is filed under Candymaking. You can follow any responses to this entry through the RSS 2.0 feed. You can leave a response, or trackback from your own site. Wow, I have never tried to make candy. You did an amazing job with these. That looks brilliant, Brian. Well done! Thanks for all the compliments. Patricia and Kieran, I have thought about what it would take to send international–hmmm. Christopher, I don’t think I have time before v-day, but later this year might be good (before summer). I know, there is so much more here than chocolate. Too bad I can’t get past the chocolate. I love toffee’s and thanks for posting this by the way. My sister and I love chocolates. I canâ€™t think about life without these sweets.